The Tastes: A little bit of spice with sweet that's nice, Oregon-based award-winning Kelly's Jelly will easily convince you that their pepper jellies and preserves offer "the perfect complement." You'll find yourself accompanying everything from roasted chicken to cheese boards to cornbread to ice cream with these jelly jewels. 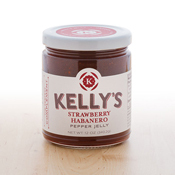 Kelly's Jelly launched with Scovie-Award-Winning (and then 2014 and 2016 Good Food Awards winning) Habanero Pepper Jelly. But taste their Strawberry Habanero Pepper Jelly, Marionberry Habanero Pepper Jelly, and Pineapple Jalapeño Pepper Jelly, and we think you'll agree that their all award worthy. 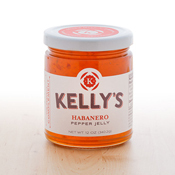 The Story: Kelly Calabria's Great Aunt Danny's recipe turned into a somewhat dangerous habanero kitchen experiment before it became Kelly's Jelly's Habanero Pepper Jelly. After finding tremendous popularity among friends and family as a holiday gift that was frequently requested in the off-season, Kelly and husband, Adam, discovered the same popularity at farmers markets, and (within a month of launching) at the national Scovie Awards. Realizing the family recipe had national appeal, they've quickly grown with a collaborative, elevate-everyone approach to entrepreneurship that will win you over as quickly as their flavors have.